I’m feeling good! The picture has nothing to do with my post tonight, I just like the picture. I’m sitting here in the living room kicked back, watching the Biggest Loser, has nothing to do with my exercise or diet, just like the show. It’s right at three years that mother and I became hooked on the presentations, just about the same stretch that I’ve taken my exercise seriously, go figure. Not sure if you watch the show but the Red team just bet that they could lose 94 pounds combined between the 9 of them, for the regular watchers, that’s just plain crazy for week 2! Average 10 pounds or so a piece! Man! Now talk about a challenge! I wish em luck. 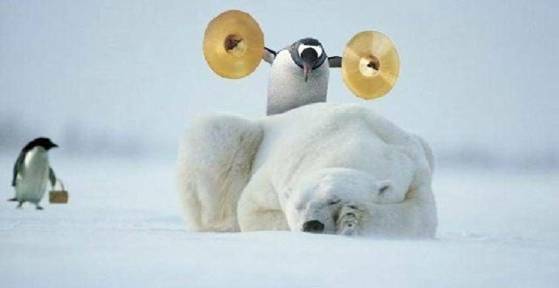 I could use to drop 20 pounds, something tells me, even as disciplined as I can be, I’d need more of a motivator than a couple penguins spanking cymbals over my head to get it done! I wish they would bring back Jillian, I have no doubt that she could whip me in a fair fight! “I lift Things Up and Put them Dowwwwwnnnn,…!” The commercial is a riot!